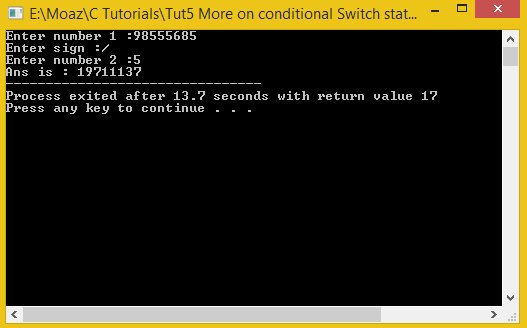 In this tutorial I will teach you how to make a calculator using two different ways, firstly using the Conditional statement method and then using switch statement. In these lines of code there are four conditions, if the character given by the user as operation is +,-,/,* the corresponding result will be produced , if these operations are not given ,words ‘Error’ will be displayed in output. Basically what happening in this code is that the compiler checks out that what character is inserted by the user and as referred to my fourth tutorial if a certain conditional statement is satisfied, then a specific operation is performed, for example the user inputs ‘/’ character and compiler comes to first statement that will work only if the character inserted is ‘+’ so it will pass on to the second statement which is ( sign == '-'), so as clearly shown that character inserted by user is ‘/’ so no operation will be performed, sequentially after passing through series of statement , compiler finds if ( sign == '/') statement and the division operation will be performed on the two integers which will be stored in another integer that is ans. There is also a possibility that the characters inserted by the user are not a proper arithmetic operation like addition, subtraction etc so the statement printf("Error") is written in the program to encounter such exceptional cases. In the last line of the program the value contained in ‘ans’ integer is displayed using printf statement . A switch statement is a statement in which we declare different statements according to which we jump to a specific set of statements performed if the user inputs are matched to the statement of the code . While using switch statements we use a keyword ‘case’ just like ‘if ’ which ensures that right set of statements are executed on a specific input, it will be become more clear as we proceed. In this program just like before we will make three integer type variables and one character type variable. Two integer type variables and one character type input is taken from the user and the result is stored in the third integer. Now the most important part is writing the switch statement. In the switch statement we make cases ( you can say possibilities ). In this program we want the program to switch to the statement according the character given +,*,/ and – so we simply pass the character variable to switch statement and make the cases according to the required characters and we break after every statement so that switch ends after executing a single statement and the program gets out of switch brackets, continuing the sequential flow. In case of any other variable is given input we switch to default case which works the same like “else condition”. Here we have added the default at the bottom so we don’t need to write any break statement. After that most our answer will be calculated if the operator is valid. Otherwise it will print error and 0 as ans. After that we write getch for pause and end the main.